Founded in 2001, George Davies Turf is a leading lawn turf supplier with depots throughout the UK. We source the highest quality turf from a company in North Lincolnshire, whose clients include Chelsea FC and Manchester United, and we endeavour to deliver our turf to your door within 8 hours. The turf we supply comes from an area where the soil is sandy, free draining and fully irrigated during the summer and will transform any environment into a lush green landscape. When you place your order we aim to cut the turf first thing in the morning and transport it to you that afternoon to arrive in perfect condition. If it can’t be delivered that day it will be refrigerated at one of our sites so that it is still fresh the next day. 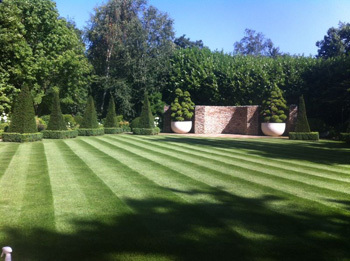 We’re a lawn turf supplier for all types and sizes of customers, including over 35 golf courses (such as Woburn and Moorpark), a number of leading national housing developers (Persimmon, Bovis and McCann Homes for example), landscapers and landscape architects, Local Authorities and households. George Davies Turf is not just a lawn turf supplier, we also sell topsoil in 1 tonne bags, which we will also deliver. We keep our costs down so you’ll find that we are a competitively priced lawn turf supplier and pride ourselves on the excellent service we offer. We sell about 600,000m2 of turf every year but we’re happy to supply you with any quantity, from one roll upwards. Our delivery lorries will be able to unload the turf exactly where you want it – even if that’s through a building site, in your driveway or next to a putting green.